Zandra Lindsey Rhodes was born in 1940 in Kent, England. Her first fashion influence was her mother, who was a fitter at the House of Worth in Paris before she became a senior lecturer in fashion at Medway College of Art. Zandra Rhodes subsequently studied textile design at the same college for two years, before going on to the Royal College of Art to extend her studies. She graduated with first class honors in 1964 from the Royal College of Art at a time when design creativity was at a premium and London was the center of avant-garde fashion. After leaving college she designed for a print studio she had established with Alexander McIntyre, until teaming up with Sylvia Ayton, a fellow graduate, to produce a range of garments in which Rhodes was able to explore innovative ideas like her famous lipstick print. In 1968 the two decided to open their own boutique, the Fulham Road Clothes Shop, selling garments designed by Sylvia Ayton and made up in Zandra Rhodes's printed fabrics. Among their most innovative ideas were tattoo print transfers and paper dresses. Renowned primarily for her evening wear, Zandra Rhodes produced instantly identifiable garments that reflected the early 1970s preoccupation with a floating, unreconstructed silhouette. During this period printed textiles were an intrinsic element of fashion, and together with Celia Birtwell and Bernard Nevill, she was responsible for the multipatterned and colorful look that defined the era. Her inspiration is rooted in the use of autographic sketchbooks, where she researched primary sources such as organic matter and transformed the initial drawings into her signature style: abstract, loose, screen-printed, flowing forms that play with scale and vibrant color combinations, all handmade and often including her signature "squiggle." Prints occasionally include handwritten text; one of her pieces for the Fulham Road Clothes Shop was a blouse printed with the name of the shop on the collar and cuffs, an early use of the logo. Zandra Rhodes was one of the first designers to use the street-style punk look, reversing seams and using safety pins and tears for a dress in the 1977 Conceptual Chic collection. Her personal style has always reflected the flamboyant quality of her clothes. She accessorized her outfits with outsized jewelry and sported green, then pink hair, with emphatic eye makeup and multicolored face paint. "I had come across the actual chronicle of costume, the definitive book by Max Tilke on Costume Patterns and Designs, its simple and detailed pages showing the cut and form of traditional clothing throughout the world. Details of armholes, wrapped trousers, embroidered waistcoats and flat, worked-out-kaftan and peasant shapes were all explained with the simplicity of a gardening book (Rhodes and Knight, p. 37). " 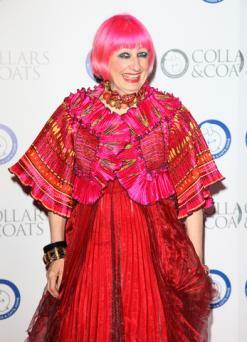 Zandra Rhodes has been the recipient of many academic and professional awards over the years, including honorary doctorates from the Royal College of Art and other universities in both Great Britain and the United States. She was made a Commander of the British Empire in 1997 in recognition of her services to the fashion and textile industry. Early in the twenty-first century, Rhodes was spending some of her time in San Diego, California, and it was here that she was invited to design the costumes for the San Diego Opera's production of The Magic Flute in 2001, garments that received great critical acclaim. Rhodes has diversified her design business into household linens and textiles, glassware, linens, cushions, throws, rugs, and screens. In collaboration with the artist David Humphries, she fashioned a number of terrazzo designs, such as the Global Plaza at Harbourside in Sydney, Australia, and the Del Mar House Terrazzo project in California, for which she was given an honor award by the National Terrazzo and Mosaic Association in 1998. 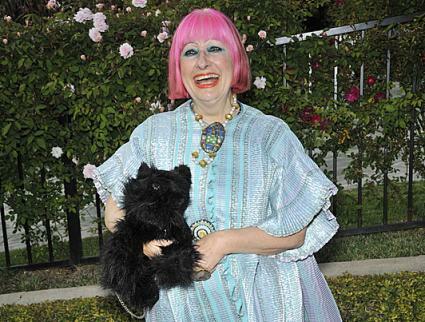 In 2003 Zandra Rhodes realized a long-held ambition to open a museum. The strikingly colored frontage of her Fashion and Textile Museum has become one of London's landmarks. Sited in Bermondsey on the south bank of the river Thames, it was designed by the Mexican architect Ricardo Legoreta. As a select showcase for contemporary and vintage fashion and textile design, the museum is intended to provide an accessible archive and resource center. It also seeks to generate discourse on design by providing a forum for debate and student activity. The inaugural exhibition, My Favourite Dress, included the work of seventy of the most internationally renowned contemporary designers, including John Galliano, Yohji Yamamoto, Julien MacDonald, Antonio Berardi, Roland Mouret, and Sophia Kokosalaki. See also Diana Princess of Wales; Evening Dress; Fashion Museums and Collections. Zandra Rhodes, and Anne Knight. The Art of Zandra Rhodes. London: Cape, 1984.